The P400 is a benchtop digital delay and pulse generator that generates four separately programmable delay-and-width outputs. The P400 can generate delays up to 1000 seconds in 1ps increments, and is capable of a high repetition rate of 10MHz. Applications for the P400 include laser timing, ICCD camera systems, ATE systems, and radar testing. Triggering - P400 triggers include internal, external, remote, or line. 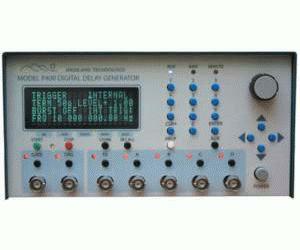 The internal DDS rate generator may be programmed from 0.01Hz to 10MHz in 0.01Hz steps. The external trigger features selectable trigger level, slope, and termination impedance. Line trigger is enabled via an external AC line adaptor. The P400 may also be triggered manually or from the remote RS-232 or Ethernet interfaces. Trigger gating and burst facilities are standard. Timebase - The standard P400 timebase is a precision TCXO temperature-compensated crystal oscillator. An optional ovenized oscillator is available for applications requiring extreme accuracy and lowest jitter. Mutiple P400s may be synchronized to each other, or locked to an external 10 MHz source. Onboard Help - An extensive help system explains each pushbutton, input, output, and setting on the 4-line front-panel display. Menus - Each function of the P400 has a dedicated single-level control menu invoked by an associated pushbutton. Data entry may be via numeric keys or by the spinner knob. Remote Control - All P400 parameters may be programmed remotely using standard RS-232 or optional Ethernet interfaces.